Part of the growing "Winning Poker Network" which bought out Doylesroom. PLAY NOW AT True Poker! 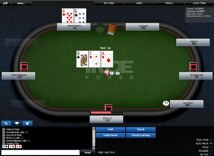 True Poker is a well-established online poker site, which uses its amazing graphics, as well as its easy to use software and its user friendliness. Owned by a professional team located in Costa Rica, they employ great management in order to give the customer what they want and more. The team behind True Poker has the objective of creating the most realistic and immersive experience for the player as possible, providing players with a fantastic software from the former Yatahay network, now called the Winner Poker network. The True Poker website is just how other websites should be, simple and easy on the eyes. Most other online poker sites try and stick as much information as they can on each page, at True Poker this is not the case. They keep it simple, which in turn makes everything easy to follow and use. By keeping the website clutter free, with just what a player would want to see or know about, makes the whole poker experience that much more enjoyable. As such, they are able to focus most of their effort towards the development of the software that is offered. The poker software is easy to download and install, and it updates automatically – unfortunately not Mac friendly. Even though they do not have a software that is compatible for mobile devices such as the iPhone and iPad also, they are sure to expand into that market soon enough. Going along with making the poker experience as realistic as possible, the software has amazing graphics, where they actually show people sitting around the table, as well as allowing the actual avatars speak during gameplay. This is obviously not part of the general “chat” option they have. 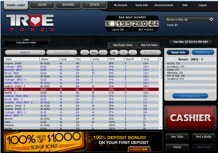 Once the software is installed, players can pick from a variety of different kinds of poker games that they would want to play. They have a great selection of Texas Hold’em tables, where experienced and inexperienced players come to test their skills and luck against each other. They also have other tables featuring Omaha, 7 stud, 3 card poker, and 32 card draw. On top of these regular tables, True Poker always have different tournaments going on. They have Sit’n’Go tournaments, fast paced with excellent chances of winning. There are other poker tournaments, whether they are guaranteed money or bounty, as well as re-entry tournaments where players get a second chance if they get knocked out early on; not to mention great promotions such as the Bad Beat Jackpots at True Poker. For all the players that have felt so confident that their hand will win just to get beat by a lucky river card, there is nothing to fret about. With the True Poker Bad Beat Jackpot, when a player loses a hand that they should have won, statistically speaking such as a four-of-a-kind of 8’s or higher, they could possibly win a jackpot that is bigger than the payout of winning that particular poker hand. The bad beat jackpot is awarded as such, 30% goes to the hand that lost, 20% to the hand that won, 10% is split between the other players at the table, and the remaining amount is divided into other areas. In order to qualify for the bad beat jackpot, a player needs to have a hand better than four 8’s, and both cards have to be in play. With this jackpot, even if you lose, you could end up winning a whole lot more, making these bad beat hands worth your while. When a new player signs up and funds their account using any of the options available such as Instadebit, NETeller, transactions or deposits, as well as using Credit Cards, they could get 100% bonus up to $1000 on their first deposit. Along with the $1000, a new player is also eligible to play in the New Depositor Freeroll. There are many other promotions at True Poker that apply towards tournaments or towards getting free playable cash. Either way, joining and playing at True Poker is a sure way to gain a new experience and winning big. Bonus 100% up to $1000.